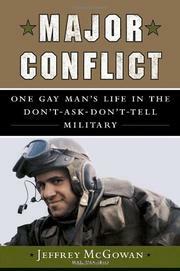 Though newcomer McGowan had long understood that the military was his calling, he wasn’t so sure about his sexuality. In a bruising, egalitarian voice, he digs hard to understand his sexual preferences, recounting how his heterosexual encounters in college didn’t have the quantifiable, vital charge of his fleeting homosexual liaisons. But his self-image as a soldier, a mighty masculine force, clashed with the feelings stirred by a certain male friend, so he stayed deep in the back of the closet. He haltingly explored his sexuality while endeavoring to fit squarely into military life, which eventually led him into an officer’s role in Operation Desert Storm. Forced to confront some major issues about the military mindset (and not just questions of homosexuality), McGowan was appalled that soldiers received so little pay that their families sometimes had to go on welfare, shocked by the treatment of women in the armed forces, and ambivalent about the stationing of American troops in Europe during peacetime. Here, he approaches all these issues with a simple strain of decency and common sense that finds a host of military practices antithetical to basic notions of equality and dignity, not the least of which was the Clinton administration’s “Don’t Ask, Don’t Tell” policy, though McGowan also gives credit that the question was examined at all. Ultimately, a foul frame-up of a man in his outfit tipped McGowan over and out of a career he never thought would end. When the author measures his own fraudulence against the venality of an ages-old military practice, it’s an incandescent moment. “If I have done anything to advance the just cause of equality for gay people, it was by accident,” McGowan writes modestly, “a result of simply finally making the decision to act.” His ringing text shows him acting with vigor.